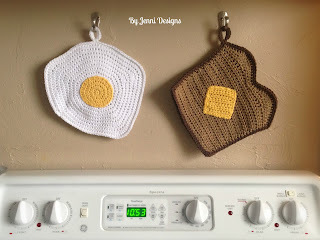 Last week I shared with you the Sunny Side Up Egg Pot Holder and now I have the Toast Pot Holder to share as well! Both of these pot holders are made with two layers to ensure you don't burn yourself while using them and please be sure you use only 100% cotton yarn! Gauge: Approx. 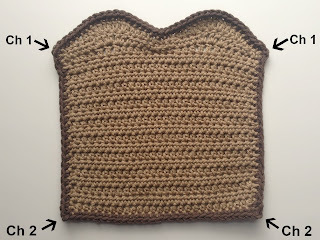 8 hdc x 6 rows = 2"
Join in any sp, ch 1 & sc around edge of bread working a ch 2 at the two lower corners of the bread & working a ch 1 at the top corners (see photo below). When working along the sides work 1 sc into the side of each hdc row. Don't work your sc's too tightly or your bread may bunch a little (feel free to switch to a hook size up for this part if you can't work the sc's loosely). You should end with 21 sc along the two sides of bread, 39 sc along the top & 27 sc along the bottom. Join, fasten off and sew in ends. After row 6, ch 1, turn & sc around the entire edge of butter working a ch 2 at each corner. Join & fasten off leaving a long end for sewing. 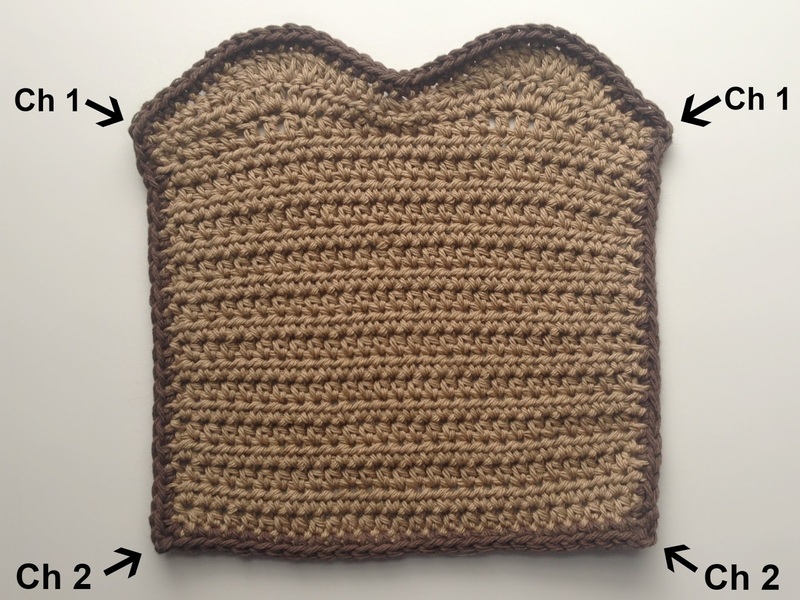 Sew butter onto one slice of bread. After you have sewn your butter on, hold the two bread slices together with the butter side facing you. Join your dark brown yarn in any space and slip stitch all the way around, you will need to ch 1 at each corner. 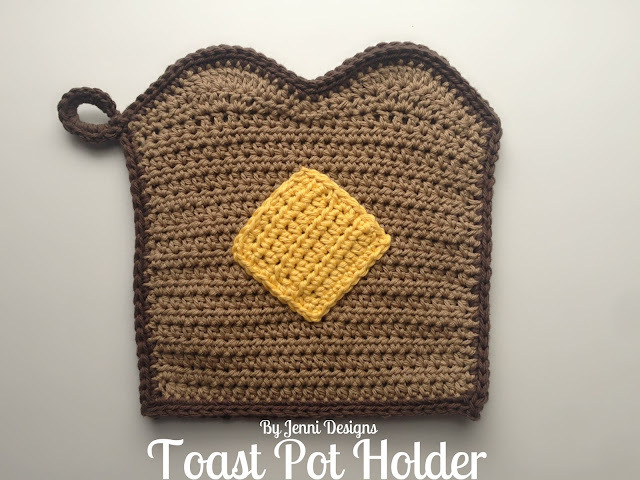 To add a loop to your pot holder first decide where you would like the loop then turn the pot holder over and join in your chosen sp on the back of the pot holder. Work the following into the sp you joined in: [Ch 8, sl st]. Ch 1, turn, work 14 sc over the ch, sl st into the same sp as the ch 8.